Your breakfast is about to get a WHOLE lot tastier. 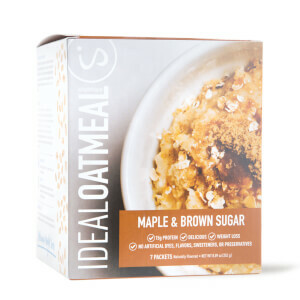 IdealOatmeal is an instant oatmeal that packs in 15g of satiating protein, as well as complex carbohydrates and soluble fiber, so you can stay fueled, combat hunger, and conquer your day. IdealOatmeal is the perfect way to ensure you get a healthy, delicious, and filling breakfast. You can make it in less than a minute and it contains proven ingredients that aid in weight loss support. Baby Rolled Oats, Non-Fat Dry Milk, Whey Protein Concentrate, Milk Protein Concentrate, Oat Fiber, Organic Evaporated Cane Juice Sugar, Natural Flavor, Salt (Sodium Chloride), Stevia Reb A 99%. This is not even Cream of Wheat (although the sugar content would suggest something similar). This was almond milk with clumps of something ... I guess the whey protein. It didn't blend together. It didn't even dissolve. It just stayed clumpy. I liked the apple cinnamon flavor, though. That was good. I Love all of the products that I have tried from Ideal Shape except the oatmeal. This was chalky and had the most terrible protein flavor. It looked like a scoop of vanilla powder with a few oats thrown in. I will be asking for a refund on this. I was looking forward to trying the oatmeal. I love oatmeal and thought I would give this one a try. I spit it out, it has a strange chalky flavor and no texture at all. This is going back for sure. I love the shakes very much so I'm going to stick to those for my morning meal. Good easy meal when you don't have time to make a breakfast. Too much sugar in the oatmeal though. I absolutely love this oatmeal. One package fills be up which is good for me because I'm the type of person who normally doesn't eat breakfast and when I actually do, it's very little. The taste is great but I would just recommend that it have less of a whey protein taste. But it's still great tasting.